Setting Up and Using My Email to Salesforce Is So Easy! In Part 1 of our series on “Email & Salesforce”, we’ll cover when and why you should be using the “My Email to Salesforce” feature. If you are a regular user (not a Salesforce Administrator or Developer), don’t run away. 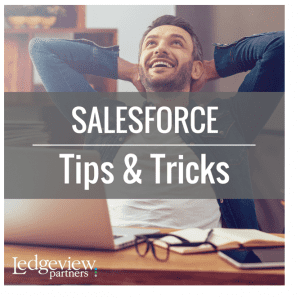 This tip is for ANY user in Salesforce and is the SIMPLEST of all the email options. My Email to Salesforce is essentially a user’s private email address for sending emails into Salesforce. One of the benefits of using this feature is that you can use it with any email address (Outlook/Yahoo/Gmail/AOL! ), with any type of desktop client (Outlook/Thunderbird), with web clients (OWA/Gmail), and even with mobile mail apps! Best of all, this feature might already be turned on in your organization, as some orgs were originally setup with this feature enabled, and other features within Salesforce (such as Enhanced Email) require it to be enabled. To get started, or to find out if My Email to Salesforce is enabled in your org, log into your instance and follow the steps below. If you do not see a menu option for My Email to Salesforce when following the steps below, then your System Administrator will need to enable this feature (Setup > Email Administration > Email to Salesforce). 1) Click on your name towards the top right of your screen. 3) In the left menu, under the Personal Setup section, expand the Email subtopic. 4) Click on My Email to Salesforce. 2) Click on My Settings. 3) In the left menu, expand the Email subtopic. 1) Click on your profile image towards the top right of your screen. 2) Right underneath your name, click on the link for Settings. Once you’ve arrived at your setup page, you will be shown a long email address that is your personalized email address with Salesforce. Copy this email into your address book with a name of “Email to Salesforce” or “Salesforce Email” or something of your liking. Further down the page, you’ll see two additional sections: My Acceptable Email Addresses, and Email Associations. By default, the email address you have registered with your Salesforce account will already be populated in the Acceptable Email Addresses section. If you have other email addresses, like Gmail accounts, other business accounts, or aliases, from which you wish to be able to send email into Salesforce, include them in this area. When looking through the options for Email Associations, make your selections based on how you want Salesforce to handle the emails you send using the My Email to Salesforce feature. Understand that if Salesforce cannot match an email address to a Lead or Contact that you have rights to see in your instance, it will put those emails in an area called My Unresolved Items, which you can typically access from the Salesforce home page. Although you can always access this section by navigating to the same area in the menu as My Email to Salesforce, as there is another menu option titled “My Unresolved Items”. • Which Email Integration Product is Right for my Company? We (Ledgeview Partners) covered this topic, along with other email options, in our September 2017 Salesforce User Group webinar. To see more information on the topic of Email and Salesforce, watch this video. You can also contact Ledgeview Partners if you need any assistance with Salesforce including enhancements, upgrades, training, support, and more.